Why do we love music so much, no matter our background or culture, and no matter what kind it is? Music brings us back to primal roots that dug themselves into our minds long ere societal ones did. This is what the blues is great at doing, whether traditional or contemporary. 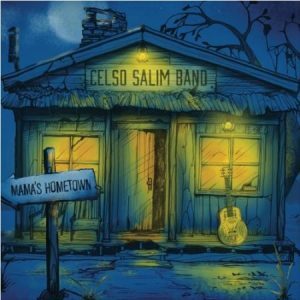 Brazilian guitarist Celso Salim presents a near-perfect fusion of these two styles on his new album, Mama’s Hometown. Its nine songs – eight originals and one classic tune (“In My Time of Dying”) – will take you back there, evoking a swamp blues atmosphere even if you live in the city. The only flaw is that a lyrics booklet should have been included. It’s hard to decipher the meanings and messages displayed in such terrific tracks. Celso and his posse provide understated but melodic singing. They let their instruments tell voodoo stories; the chief shaman is the dobro. It weaves a spell to lull one awake, not asleep. Salim started playing guitar at the age of six; by his teens he was focusing on early blues artists. From ages seventeen to twenty, he lived in the United States where he got deeply involved with a variety of American styles including country, folk, jazz, soul and rock. With five solo albums to his credit, he’s becoming one of the busiest and most respected blues artists from Brazil. In a short period living in Los Angeles, he did openings for Canned Heat and Kim Wilson. After winning first place in the 2015 Southern California Blues Society (SCBS) Battle of the Bands, he represented the SCBS at the International Blues Challenge in 2016. Along with Celso on guitar, dobro and vocals are Rafael Cury on vocals; David Fraser on piano, keyboards and harmony vocals; Mike Hightower on electric and upright bass and harmony vocals, and Lynn Coulter on drums, percussion and harmony vocals. Special guests include Darryl Carriere on harmonica for track two, Mo Beeks on Hammond B3 on tracks one, four and seven, and Minique Taylor on harmony vocals for tracks five and seven. Track 01: “Mad Dog” – Not since Eric Clapton’s “Pretending” has there been a blues rock song so exhilarating. Sometimes when everyone goes all out, vocally and instrumentally, the result is loud chaos. This time, magic happens. The title character “lives his life running from the law, raising hell from dusk till dawn, getting high, chasing women…” If this tune’s so jaunty, why is it played in a minor instead of a major key? It’s because we all know what happens to mad dogs if they’re ever caught: they’re put down. Revel in how Celso sings “moving” near the finale, and play air piano along with David Fraser during his dynamite solo. Track 02: “Locked Out in Misery” – Time for good old Chicago blues, featuring a good old Chicago blues theme: when your lady won’t let you in the house because she’s quit you. This song’s subject has lost not only his home, but his car and children. He can find solace in Darryl Carriere’s rueful harmonica. Track 07: “Mama’s Hometown” – The title track can be summed up in two words: “dobro heaven.” It’s a slow burner featuring long slides and reverberations of the strings, a perfect tune for ambiance while sitting out on the porch and drinking lemonade. Dig the harmony vocals, too. Mama’s Hometown is a magical, musical place where everyone is welcome!